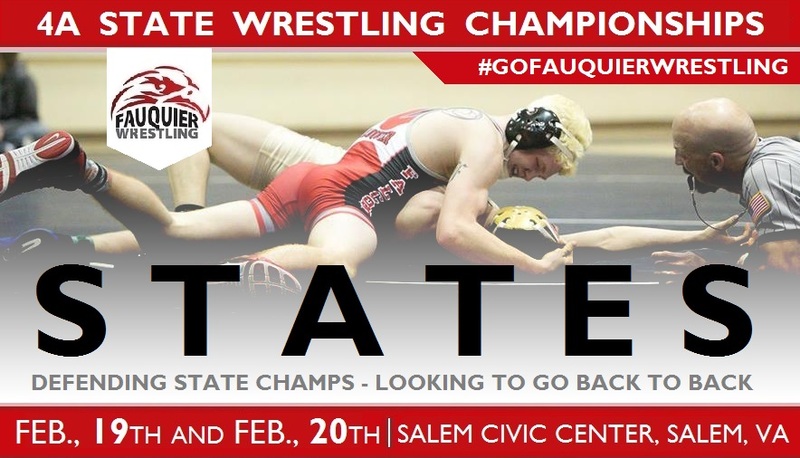 Salem, VA: As day two started at the 4A Virginia State Wrestling Championship on the morning of Saturday, Feb., 20 team Fauquier held the lead by 1 point with 85.5 points over Eastern View. The stage was set for a show down between these two Northern Virginia teams as both squads had the depth to continue to score team points. 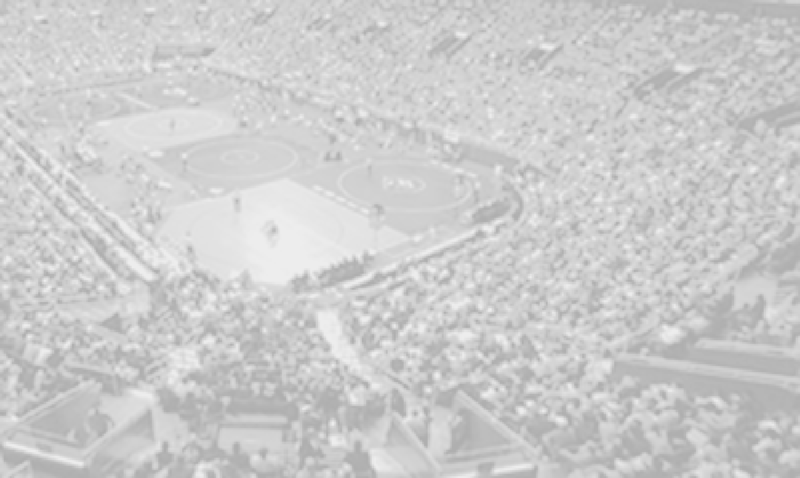 As the Championship Semi-Finals took place the day before team Fauquier pushed four wrestlers into the Championship Finals sophomore (113) Kyle Budd, Junior (138) Kyle Roche, Senior (160) Garrett Tingen, and Senior (170) Clifford Harrison as they are scheduled for bouts later today. One of these Championship Final matches will be a feature a head-to-head bout with Fauquier Garrett Tingen and Kaden Woodward - Eastern View – stay tuned. With the Consolations Semi-Finals finishing earlier this morning team Fauquier had two wrestlers on deck, Junior (126) Ty Foster and Senior (145) Caleb Strum as they both won. 126 Ty Foster won by pin (2:04) over Brett Deese - Smithfield. Foster was able to get a first period takedown and a set of back points and then halfway through the second period earned the pin. This pin gave Fauquier +7 points as team Fauquier moved up 92.5 team points. Also, this win moved Foster into the Consolations Finals. 145 Caleb Strum won 9-1 over Kyle Canavan - Great Bridge. Strum scored the first takedown the last 12 seconds of the first period to go up 2-0. Canavan was in the down position as Strum was able to hold him on his back in a front head lock for a three near fall. The match score was 5-0 the end of the second period. Strum then took the bottom position to start the third period and reversed Canvan and earned a two point as Strum let Canavan up for an escape the last 3 seconds of the match to seal the win. This win gave Fauquier +6 points as team Fauquier moved up to 98.5 points. This victory by Strum also moved him into the Consolation Finals. At the end of the Consolations Semi-Finals team Fauquier went 2-0 as Eastern View would post a 1-6 round record. The Falcons would also stretch the lead to 10 points over Eastern View. Fauquier would rest with 98.5 points over Eastern View - 89.5 points. At this point Great Bridge who would be in third place would not have the numbers to catch ether the top two teams. As Eastern View would have six bouts in the fifth and sixth Finals, Fauquier had none. At the conclusion of the fifth and six finals Fauquier lead would squandered to a one point lead over Eastern View. Eastern View went 3-3 and improved to 97.5 points while Fauquier still would rest with 98.5 points. With the start of the Consolation Finals Fauquier would still have six more bouts to wrestle (four in the finals and two in the cons finals) whereas Eastern View would have four (three in the finals and one in the cons finals). 126 Ty Foster won by pin (1:46) over Mike Duffy - Sherando. Foster was able to get a first period takedown to go up 2-0 the end of the first period. Foster choosing down the start of the second period got a reversal and a pin with in the first 45 seconds of play in the second period. This pin gave Fauquier +4 points as team Fauquier moved up to 102.5 team points. Ty Foster also earns a third place State medal. 145 Caleb Strum won 4-1 over Devyn Kreb - John Champe. First period ended with a 0-0 as Strum was in on two good shots during this period. The start of the second period Strum was down and able to get a reverse at the 50 second mark of the period to go up 2-0. Both wrestlers at this point were moving at a fast pace and a high level as Strum was able to ride him to the end of the period to keep the score at 2-0 Strum. Kreb then also opted for the down position to start the third period. At the 50 second mark Strum recorded a tilt for a two near fall for Strum to go up 4-0. Kred got an escape the last 15 second to end the match with a Strum victory 4-1. This win gave Fauquier +2 points as team Fauquier moved up to 104.5 team points. Caleb Strum also earns a third place medal.